A manufacturer of hi-fi systems has sounded what it said could be the death knell of the compact disc player. 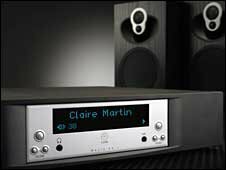 Linn Products has become the first manufacturer to announce it will give up on CDs from the start of next year. Instead, the niche company, based in East Renfrewshire, will focus on producing digital streaming equipment. Linn, which has its own small record label, foresees a move to what it calls Studio Master Quality material, available for download. The shift from CD players to digital music streamers has been very recent. It was only during 2009 that the digital players outsold Linn's CD players. The newer technology allows digital streaming through other operating systems, including home computers and networking throughout homes. Gilad Tiefenbrun, managing director of Linn Products, said: "Our customers have fast recognised the limitations of CD players and in the age of home networking, people now want better control of their music and the ability to enjoy it in any room of their home. "CD players no longer belong in the specialist domain." The company reckons that the CD format will continue to be useful as a way of recording and storing music. It claims that a CD recorded onto a hard disk can achieve a higher quality than one played on a CD player. Compact discs began commercial music sales in 1982, replacing the cassette tape as well as vinyl records. The shift from compact discs to digital downloading is again changing the music market. BPI, representing the British recorded music industry, announced last month that 2009 had already broken last year's record number of legally downloaded single and individual track sales. Of 117 million sales, nearly 99% were digital downloads. But there is a different market for album sales. CD sales continue to dominate, but their share of the market is sliding. In 2006, there were 154 million album sales, of which CDs accounted for 151m, and digital for 2.7m. In 2007, with 138m sales, 131m were CDs and 6.2m were digital. In 2008, there were 137m album sales, with 123m CDs and 10.3m digital downloads. Vinyl records, cassettes and other formats accounted for around 300,000.